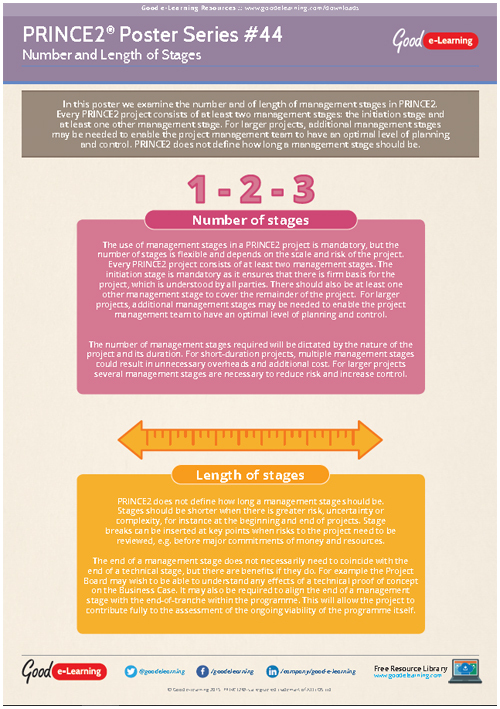 In this PRINCE2 poster we examine the number and of length of management stages in PRINCE2. Every PRINCE2 project consists of at least two management stages: the initiation stage and at least one other management stage. For larger projects, additional management stages may be needed to enable the project management team to have an optimal level of planning and control. PRINCE2 does not define how long a management stage should be. If this PRINCE2 resource interests you, why not view our other Project Management learning resources? Or view our full library of downloads covering a wide range of subjects and domains!